The Palestine Solidarity Campaign’s AGM last month resulted in what can only be described as a significant step back for the British anti-imperialist movement and a significant victory for zionism. That is, they voted to give the PSC’s executive the ability to discipline and expel sincere and useful solidarity activists for committing a ‘crime’ that exists only in the zionist imagination – the crime of ‘minimising the holocaust’. And, whether they realised it or not, they simultaneously voted to endorse the zionist conflation of two terms that have no actual connection: racism and holocaust denial/‘holocaust minimising’. Not that this is all that surprising in a country where ordinary people are so totally saturated with and generally accepting of imperialist propaganda. Even the fact that the PSC statement referred simply to ‘the holocaust’ rather than ‘the jewish holocaust’ shows how in thrall its writers are to the prevailing imperialist and zionist rhetoric, even if only subconsciously. Speaking for the CPGB-ML, I proposed an amendment to the executive’s motion on anti-semitism that asked the campaign to keep to its primary focus of carrying out “effective work in solidarity with Palestine, against zionism and imperialism”. During my speech from the floor I emphasised the point that the more effective and influential the Palestine solidarity movement becomes, the more vociferously it can expect to be attacked by Israel’s supporters – which inevitably means being accused of ‘anti-semitism’ by hysterical zionist campaigners. As if to prove the point that ‘holocaust minimising’ is a crime that anyone can be accused of, I found the trick being used against me by PSC Secretary Ben Soffa, who managed to twist my words with impressive sophistry. I had pointed out that those who ask any kind of question about the Nazi holocaust, or who challenge any of Israel’s founding myths, are all labelled ‘holocaust deniers’, ‘anti-semites’ and ‘racists’ by the zionist lobby. According to Ben, however, what I’d said was that the jewish holocaust was a myth! To underline the point, the meeting also voted to expel an activist from Brighton on the basis that he was deemed to be a holocaust denier and therefore ‘anti-semitic’. Just as in my local branch’s discussions, the case for the prosecution at the AGM focused not on why the accused member’s views meant he could not be useful as a PSC activist, but on whether those present agreed with him or not; whether they found his alleged views personally acceptable. It’s a clever sleight-of-hand, but an important one for those interested in building a broad-based mass movement for Palestine. I suppose at this point I have to say (again) that I have no interest in denying the truth or the horror of the Nazi crimes against the jews of Europe. But whether I do or not is NOT the business of the Palestine Solidarity Campaign. Those who try to make it our business should simply be asked, firmly but politely, to take their discussions elsewhere. Mass movement or liberal charity? 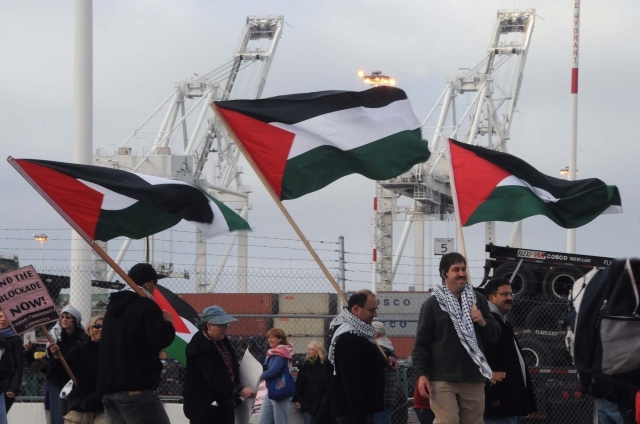 As far as I can see, the only points we all need to agree on are that the Palestinians have the right to decide what their minimum programme should be, as well as to chose their own leadership and their own forms of struggle, and that British people should be mobilised to support the just Palestinian struggle for self-determination and to stop Britain’s participation in and backing for the criminal zionist project. Insisting on further points of agreement does not serve this agenda; it does not help Palestine. What was especially tragic about the antics at the AGM was the way that the timetable for the day was manipulated so that discussion of these diversionary non-issues took up most of the available debating time – to such an extent that several important motions were dropped off the day’s order paper. Almost all of those wishing to oppose the leadership’s agenda were stopped from speaking by the chair, while speaker after filibustering speaker was invited to come to the mic to endorse the leadership’s position and waste what little debating time was available. Even these speakers, antagonistic as they were to our party’s agenda, had to concede our main points: that the jewish holocaust was not the unique event that zionist propaganda portrays it as being, but one of an ongoing string of catastrophic industrial-scale massacres that have been a hallmark of the imperialist system since it arrived on the scene over a century ago; and that it is the system of imperialism that we must fight if we are serious about supporting Palestine. Comrade Harpal Brar received extremely warm applause in the hall when he made these points, pointing out the absurdity of obsessing over one of imperialism’s holocausts to the exclusion of all others. Indeed, the jewish holocaust made up just one small part of the gigantic holocausts that were the two world wars of the 20th century, perpetrated by the imperialists in order to save their rotten system at the expense of 100 million lives. The jewish holocaust, he said, was not the murder of one race by another race but the murder of human beings by imperialism. Similarly, Israel itself is not a jewish project, despite its window dressing, but an imperialist project aimed at controlling the vital resources of the Middle East. Far from being the defender of jews that it claims to be, Israel does untold damage to the interests of jewish workers, just as it does to those of Arabs and, indeed, to those of workers all over the world. Many of the activists present were seriously disgruntled about the lack of time dedicated to discussing the campaign’s real plan for action in support of Palestine, feeling that the day had been given over to a zionist-inspired witch hunt, whose only motivation seemed to be that of keeping the PSC ‘respectable’ in the eyes of its establishment patrons. Many also found it worrying that so few actual Palestinians were present – either on the day or in the organisation generally. One telling tactic that was used during the debate was the threat of disaffiliation by the campaign’s big union backers. What would Unite do, we were asked, if they got wind of even a hint that the PSC was being accused of anti-semitism? Drop us like a hot potato, of course, came the unspoken response. And so the debate, what little of it there was, died. After all, we don’t want to lose our connection with all those organised workers, do we? The affiliation of major unions like Unite to the PSC in recent years has been hailed as a major breakthrough in the campaign’s progress; proof that we are becoming ‘mainstream’. The outcome of such affiliations, however, has not been quite what the more optimistic of us might have expected. Instead of harnessing the collective power of Unite’s 1.5 million members in active solidarity with Palestine, the PSC has merely been given an opportunity to distribute postcards to union members aimed at persuading them to boycott settlement goods when making their weekly supermarket shop. But while moving a few people (or even a few thousand people) to make individual consumer choices may reflect a certain level of awareness and sympathy amongst the British population generally, it is no substitute for mobilising them for collective action; and not much threat to Israel either, if taken no further. How much more effective would it be if Unite organised its lorry drivers to refuse to handle the goods to start with? Or if Usdaw backed its shop workers in refusing to put Israeli goods on the shelves? Or if the RMT organised members engaged in transporting freight by rail and sea to refuse to handle goods or weapons coming from or going to Israel? Or if the NUJ’s journalists stopped regurgitating zionist lies in Britain’s mainstream media? Far from harnessing the power of Unite’s workers in support of Palestinian liberation, the affiliation has instead brought the power of Unite’s Labour-affiliated leaders into the PSC, where it is being used to crush any chance of organising the type of really effective Palestine solidarity work that might actually help Palestine by harming Israel – because in the process it would also damage British corporate interests. Which brings us back to those critical undebated motions. The last item on the day’s agenda was the CPGB-ML’s motion on non-cooperation, which called on the PSC to mobilise British workers to follow the brave example of their South African counterparts. Yet although the PSC’s leaders seemed perfectly happy to applaud such actions being taken elsewhere, they were clearly determined to avoid even a discussion about replicating them here in Britain. Having made sure the motion’s contents wouldn’t be debated at the AGM, the executive has quietly dropped all mention of the motion in its online summation of the meeting. If elected, I told them, I would focus my energies on organising and coordinating active non-cooperation work. In particular, as a media worker myself, I offered to work with other media worker members in PSC to get resolutions to the Bectu and NUJ conferences on the subject of non-cooperation with Israeli war crimes. I emphasised the need to recognise the crucial role the media plays in supporting the zionist narrative and obliterating the Palestinian one, and reminded the activists of the Nuremberg rulings, which made it clear that propagating in favour of illegal wars and occupations is a war crime. That being so, I told them, it is vital that our media unions start to take a stand and protect their members from such involvement. Interestingly, although I clearly wasn’t on the executive’s pre-approved list, and therefore had very little chance of being elected, this message was not so unpopular with the delegates as the leadership might have hoped. I received 119 votes (around 50 less than was needed to be elected). The issue of active non-cooperation goes right to the very heart of what ‘solidarity’ actually means, bringing to workers’ attention the very real power that they have to change things when they act collectively. It is understandable that the imperialists don’t want us to talk about this. Understandable, too, that the bought-and-paid-for labour aristocrats of the TUC and the Labour party should prefer to crush all such discussion, harmful as it is to the imperialist interests that they ultimately serve. What is neither understandable nor forgivable is that the leadership of the Palestine Solidarity Campaign should be so averse to giving workers this message. Yet such is clearly the case. Every tactic continues to be used within the campaign to supress and sideline discussion on this vital aspect of our work, while those who do bring up the subject are treated as pariahs and portrayed as a hostile presence in the organisation. The one vote that didn’t go the executive’s way was over a proposed constitutional amendment that aimed to expedite the process for expelling activists by removing their right to appeal to an AGM. Clearly, the tenor of the day’s debate had awoken a significant section of the delegates to the possibility that the proposed changes might not be inspired by benign motivations, so that the necessary two-thirds majority was not achieved. Meanwhile, if anyone doubts that it is Labour and not we communists who are the real threat to the building of an effective mass movement for Palestine solidarity in Britain, perhaps they should think about the recent all-expenses-paid trip to Israel taken by a delegation of bright young Labour hopefuls, all in leadership positions within Labour’s youth and student organisations. Paid for by the Union of Jewish Students (UJS), a frontline defender of the zionist state in Britain, the delegates were schmoozed by Israeli war criminals such as army spokesman Captain Barak Raz and Netanyahu spokesman Mark Regev, as well as by Britain’s own arch-war criminal (sorry, ‘peace envoy’) Tony Blair. Since Labour has given ample proof of its willingness to commit any crime in the cause of protecting British imperialist interests, it is hardly surprising that the party and its leaders continue to be committed backers of fascist Israel and defenders of its racist zionist ideology. What is surprising is that those who want to go against imperialist interests by supporting the Palestinian struggle for self-determination should allow their campaign to be misled by people who are tangled in a web of personal connections and political affiliations to that self-same warmongering, zionist-backing organisation.